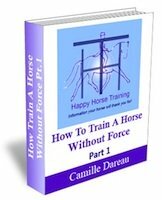 Horse conformation is of great significance in dressage training. The better a horse is put together the more easily he will be able to move and therefore perform under saddle. 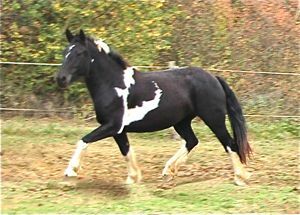 Is there nothing more to dressage then, than finding the best made horse we can afford? The question of how much horse conformation matters entirely depends on what matters to the individual rider. 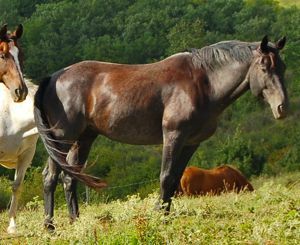 Horse riding is one of the few sports where humans can improve on their own performance considerably by finding a better partner. Or can they? In fact any improvement is rarely genuine, simply because it is a partnership. Not only this, the playing field is not level. 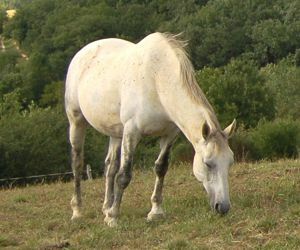 Rider and horse perform different roles in this partnership, so it is unlikely that the horse can make up for the riders inefficiencies any more than the rider can make up for the horse. What is the Rider's Role In the Partnership? Both rider and horse are like cogs in one machine. The two cogs are different sizes and shapes, but they must both harmonize together to produce a true engagement. Engagement is the building block of dressage. 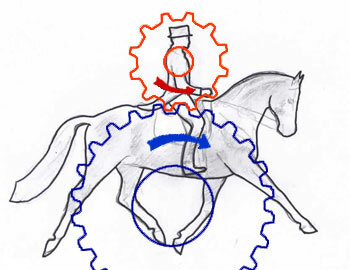 This is why the rider's seat plays such a crucial role, it is the interface between rider and horse, the place where the two cogs meet. Imagine a bicycle chain in action, it must stretch and adhere to the structure beneath to transmit the movement. Otherwise the wheels will move without moving the bike! Unfortunately free-wheeling horses are a common site in the dressage arena. So the rider uses the connection with the horse's movement to channel that movement. This channeling involves straightening and balancing, which are two sides of the same coin. 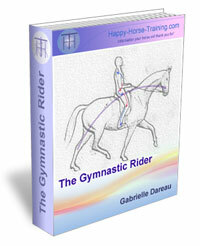 The rider's role, then, is principally postural control. What is the Horse's Role In the Partnership? The horse is the structural part of the bicycle, and the mechanism, the mover. His role is to move only. To willingly give up his body. This is where the line is often crossed, as riders often forget how important this willingness is in their relationship. A slave will never function in the same way as a partner, no matter how disguised that slavery may be. Going back to the original question, how does horse conformation influence our riding success? Like any question in life, there are always pro's and con's. 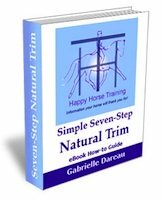 If a rider seeks a horse with 'better' conformation they will indeed have less difficulty both straightening and balancing that horse. 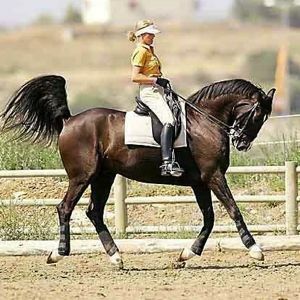 The counter balance to this, though, is that such a horse is likely to have more athletic, scopey paces, and a rider without enough postural strength and a sufficiently dynamic and flexible seat, will struggle to bring the best out in such a horse. This is the typical water-skiing-on-the-reins relationship we see in modern dressage (this photo, right, shows an extreme example of this). If the rider's interest is purely to further their own riding ability, then there is no better opportunity (once a certain level of independence has been achieved in the seat) than to work with horses who are conformationally imperfect (bottom photo, right). It is certainly not the fastest way to a red rosette, but the satisfaction and understanding gained outweighs the loss of an opportunity to show off! Horses are all born crooked to a greater or lesser extent. This is disguised to a greater or lesser extent by their conformational qualities. Finding and correcting this crookedness is the true role of the rider. We believe that the true art of dressage is to improve the natural paces of any horse, and this of course involves addressing any horse conformation issues or faults which influence the paces. 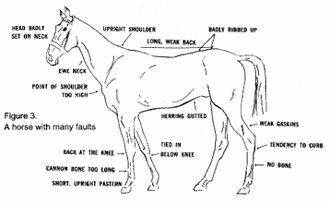 Not only does this demand understanding of the horse but it demands also that the rider's own straightness and conformational aptitudes or faults to be recognized. 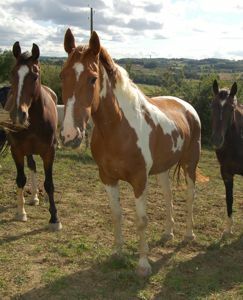 This page introduce some of the horses we have worked with who have overcome severe horse conformation imperfections. Although their success in a dressage arena would be limited, especially now in the days of super-horses, they have won their own medals in terms of their accomplishments despite their physical limitations. Kafa the 'Crooked Horse' lives up to his name. As well as a ewe neck and a weak back, his limbs are crooked in every direction possible. 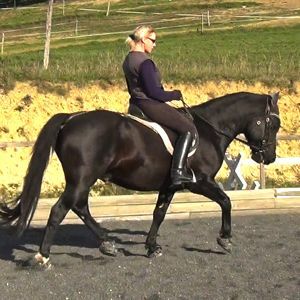 His story describes what can be achieved with a horse so unsuitable for dressage training. Mojo the Post-Legged Horse has hind-legs like the legs of a table. His general appearance is fairly pleasing to the eye, but the difficulties his open joints, and consequently weak and unstable stifles, gave him during his training process seemed insurmountable at times. Ca-Va was born with a leg deformity in both front limbs which worsened as she grew older. Her story tells of the effect this has had on her feet and the rest of her body, and the journey we have made with her towards healing and functionality.